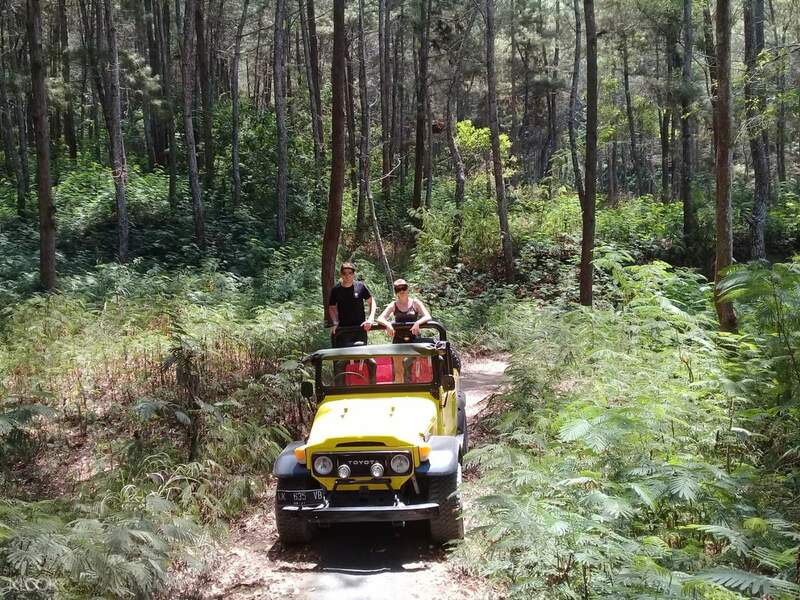 Let a professional 4WD jeep specialist accompany you, and enjoy the lunch and free hotel pick up/drop off! Take your Bali visit to new heights—literally—during this tour of Mount Batur and the surrounding areas! Mount Batur is an active volcano situated in the Bangli region on the island of Bali, Indonesia. While Mount Batur is relatively quiet today, it has erupted a number of times in the past, which explains the vast black lava fields that spill down the slopes of the volcano. 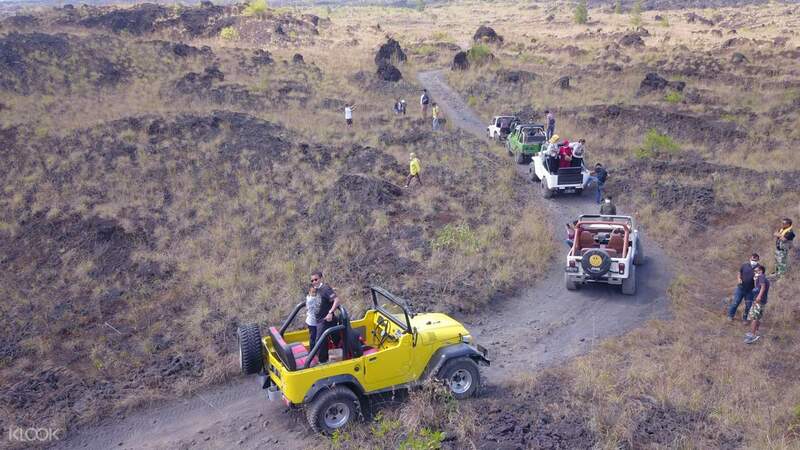 On this adventure, you'll take a 4WD jeep to drive through Kintamani and explore Mount Batur. You'll pass through the black sand and lava-formed hills, and admire the breathtaking views of the island from the edge of the volcano. You'll also explore the majestic forest, and finally end the tour with a long, relaxing soak in the healing waters of Batur Natural Hot Spring. Throughout the duration of the experience, expect great stories about the history of the region, as well as interesting information about the features of the landscape! Choose the private adventure package and enjoy the whole day with just your friends and family! 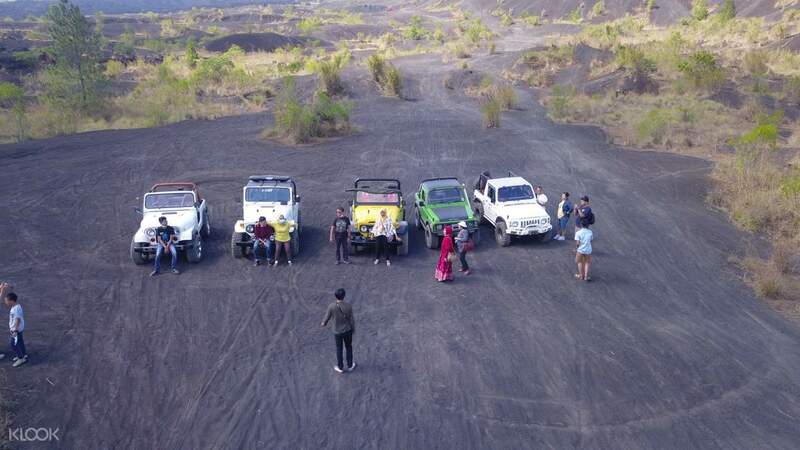 I have no regrets booking the Mt Batur jeep trip in Dec 2018 with Klook. It was an eye-opening experience! Our drivers, Gede and Jezu, were hospitable and accommodating. We had such a great time in Mt Batur, the hot spring and the coffee plantation. This is one of the trips i will never forget! Thanks to Klook for having this trip in the itinerary to choose from! I have no regrets booking the Mt Batur jeep trip in Dec 2018 with Klook. It was an eye-opening experience! Our drivers, Gede and Jezu, were hospitable and accommodating. We had such a great time in Mt Batur, the hot spring and the coffee plantation. This is one of the trips i will never forget! Thanks to Klook for having this trip in the itinerary to choose from! Bobby and Mohawk were nice drivers. They were very willing to take our pictures and had great sense of humor. Batur Volcano was awesome and the restaurant was good and cheap with a killer view of the volcano. Bobby and Mohawk were nice drivers. They were very willing to take our pictures and had great sense of humor. Batur Volcano was awesome and the restaurant was good and cheap with a killer view of the volcano. amazing tour. serenic view and natural hot spring was amazing experience. amazing tour. serenic view and natural hot spring was amazing experience. such a raw and amazing experience if you dont have the chance to climb mt batur itself. Our driver (Sorry i forgot your name!!) came on time, even earlier then expected! he brought us to the 1st stop, which is the coffee plantation. along the way he told us about the balinese culture and asked us if we were ok during the journey. My husband and i have been to afew different coffee plantation before, but this! we were greeted by a friendly & funny guy who showed us around and he speaks really good english 😁 after that, it was roughly a 20mins ride to get to the jeep. Our jeep driver was good too! 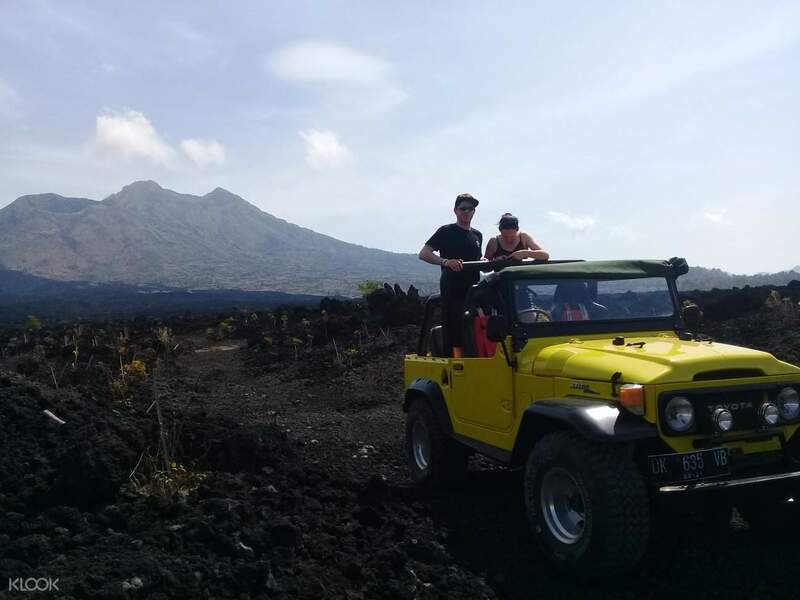 (Sorry i forgot his name either) he then brought us to the black lava and black sand near the base of mt batur and it was a very bumpy ride indeed. there you can see lots of locals on dirtbikes trying to go up the slope and you can enjoy the picturesque view of the volcano at the same time. afterwards, it was another 25mins to the hot spring & lunch. lunch was not too bad, hot spring is amazing overlooking mt batur, just that the water has alot of foreign things in it as its not filtered and coming from a natural source. once we're done soaking, we got towels from the counter and changed and back to the hotel we go in the car. Overall experience was awesome! would really recommend to those who wants to see mt batur up close but not trek it! Thank you so much for the amazing day my husband and i loved it! such a raw and amazing experience if you dont have the chance to climb mt batur itself. Our driver (Sorry i forgot your name!!) came on time, even earlier then expected! he brought us to the 1st stop, which is the coffee plantation. along the way he told us about the balinese culture and asked us if we were ok during the journey. My husband and i have been to afew different coffee plantation before, but this! we were greeted by a friendly & funny guy who showed us around and he speaks really good english 😁 after that, it was roughly a 20mins ride to get to the jeep. Our jeep driver was good too! (Sorry i forgot his name either) he then brought us to the black lava and black sand near the base of mt batur and it was a very bumpy ride indeed. there you can see lots of locals on dirtbikes trying to go up the slope and you can enjoy the picturesque view of the volcano at the same time. afterwards, it was another 25mins to the hot spring & lunch. lunch was not too bad, hot spring is amazing overlooking mt batur, just that the water has alot of foreign things in it as its not filtered and coming from a natural source. once we're done soaking, we got towels from the counter and changed and back to the hotel we go in the car. Overall experience was awesome! would really recommend to those who wants to see mt batur up close but not trek it! Thank you so much for the amazing day my husband and i loved it! We had booked pvt tour so vehicle came to pick us up at exact mentioned time.. The 4WD pick up point was 2 hours drive from our hotel.. Due to some confusion the 4WD came half hour late to pick us up.. No complaints here.. They provided us with Balinese coffee and Light snacks to keep us busy.. plus I got to interact with locals.. Then an open Land Cruiser Jeep came us to pick us up.. They took us through Rough Terrain, small paths that were formed due to lava that came out from volcano.. Showed different types of lava.. Then took us to lava sand.. We could also see smoke still coming from the live volcano obviously from some distance.. it was good 2-2.5 hour tour.. Then he dropped us to Natural Hot Water spring.. it was very beautiful view, very scenic as climate was fairly good on the day we went.. we again switched to normal car that took us to local restaurant to have Indonesian food ( Decent food included in package however not everyone would like it so carry light snacks of own if you are choosy about food ).. Then we were dropped back to our hotel.. I would recommend you this trip if you like to do something which is very unique.. Me and my wife enjoyed a lot.. We had booked pvt tour so vehicle came to pick us up at exact mentioned time.. The 4WD pick up point was 2 hours drive from our hotel.. Due to some confusion the 4WD came half hour late to pick us up.. No complaints here.. They provided us with Balinese coffee and Light snacks to keep us busy.. plus I got to interact with locals.. Then an open Land Cruiser Jeep came us to pick us up.. They took us through Rough Terrain, small paths that were formed due to lava that came out from volcano.. Showed different types of lava.. Then took us to lava sand.. We could also see smoke still coming from the live volcano obviously from some distance.. it was good 2-2.5 hour tour.. Then he dropped us to Natural Hot Water spring.. it was very beautiful view, very scenic as climate was fairly good on the day we went.. we again switched to normal car that took us to local restaurant to have Indonesian food ( Decent food included in package however not everyone would like it so carry light snacks of own if you are choosy about food ).. Then we were dropped back to our hotel.. I would recommend you this trip if you like to do something which is very unique.. Me and my wife enjoyed a lot..
Our driver for the previous day, Eddie, turned out to be our Jeep driver. The Jeep ride itself was really fun! The bumpy road had some really good view! Saw some tiny plants on the black stones, I’m guessing the Balinese are trying to revert the lane back into its greenery state. The photo opportunities at black lava were endless!! We then went on the black sand slide. It’s something like the black lava, just that it was more sandy and less bumpy. You can try to get off the Jeep and climb the sandy hill if you are adventurous enough. Had a ride around the village and it was pretty alright. Ride was too bumpy to notice how the villages lived by. Next was lunch, nothing fantastic, service was pretty slow. But can’t complain much since it’s provided within the package. Last stop was hot spring. There were quite a few pools but they were all same-same but different. It was raining on the day of visit so we didn’t manage to explore entirely on what was available. Skipped the coffee/tea plantation as we have visited it on another day! Overall, it’s still worth a go, something refreshing!! Our driver for the previous day, Eddie, turned out to be our Jeep driver. The Jeep ride itself was really fun! The bumpy road had some really good view! Saw some tiny plants on the black stones, I’m guessing the Balinese are trying to revert the lane back into its greenery state. The photo opportunities at black lava were endless!! We then went on the black sand slide. It’s something like the black lava, just that it was more sandy and less bumpy. You can try to get off the Jeep and climb the sandy hill if you are adventurous enough. Had a ride around the village and it was pretty alright. Ride was too bumpy to notice how the villages lived by. Next was lunch, nothing fantastic, service was pretty slow. But can’t complain much since it’s provided within the package. Last stop was hot spring. There were quite a few pools but they were all same-same but different. It was raining on the day of visit so we didn’t manage to explore entirely on what was available. Skipped the coffee/tea plantation as we have visited it on another day! Overall, it’s still worth a go, something refreshing!! Had a great day would recommend this activity to everyone. Our guide Eddie was great and explained everything as the day went on. Had a great day would recommend this activity to everyone. Our guide Eddie was great and explained everything as the day went on.